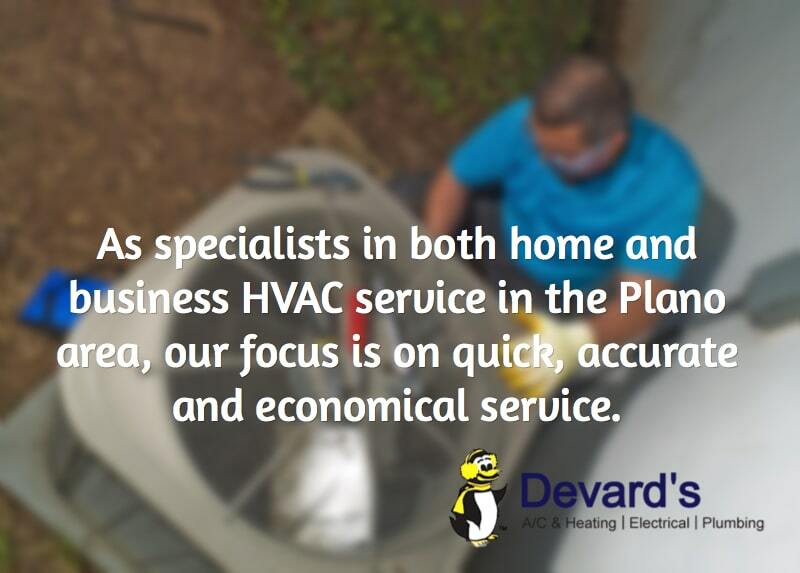 If it’s time for air conditioner service businessowners and homeowners in Plano, like you, can trust completely no matter the time of day or night, it’s time to contact Devard’s. We’re the heating and cooling service company you can trust for your air conditioner maintenance, repair and installation needs. With our long history of industry-leading service to people across North Texas, we have the right experience to meet your needs. How may we help you? Because we’ve been serving Texas since 1968, we understand the urgent need for air conditioner service when temperatures outside are soaring, and we know that temps inside your Plano home or business can rise dramatically within minutes when your system fails. That’s why we come when needed and can be depended upon for AC service that helps prevent problems and puts things right when issues occur. We send only the very best quality and specially trained service technicians to your home or business so we can complete the job quickly, usually in one visit. We treat your property with respect and avoid creating additional damage. We get necessary permits so your work complies with Plano building codes, if necessary. We gladly accept a range of credit cards so that payment is as easy as possible. We use only the best repair parts, never seconds or knockoffs. There’s a good chance you’ve already seen our trucks in your neighborhood satisfying your neighbors, and we’ll be here for you when you need us as well. No matter if your Plano AC unit has already failed, you think it soon will or you want preventative steps taken to prolong the life of your system, turn to us at Devard’s. We know you aren’t an expert at dealing with air conditioner service needs, but we can take the pain and worry out of having to deal with these and other issues related to an aging air conditioner. Contacting us brings experienced help to you right away. For air conditioner service Plano homeowners and businesspeople like you can depend on completely, turning to our team at Devard’s just makes sense. Give us a call at (972) 422-1505 or fill out the convenient form for high-quality and rapid service that gets the job done.